Precision planning has ensured the delivery by Qualter Hall of a vital swing bridge to Redrow's Harbour Village development in Fleetwood and represents key infrastructure improvement for the area. 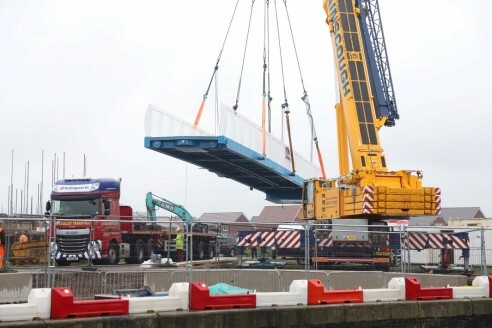 Police forces and council authorities were involved in the operation to transport the 27m long bridge from Barnsley, where it was built, to the Lancashire seaside town around 100 miles away. The bridge will provide a pedestrian/cycleway link from Redrow's prestigious housing development with the harbour, the Freeport shopping outlet village and the high street of the town. "It has been the result of months of design and planning to create this specialised structure, and to transport it from the manufacturers to its destination", said Chris Mills, Technical Director for Redrow Homes (Lancashire). "Operations like this take time and intricate planning to make sure that the process goes smoothly from the moment it leaves its construction base to the moment it arrives at its destination and is installed". 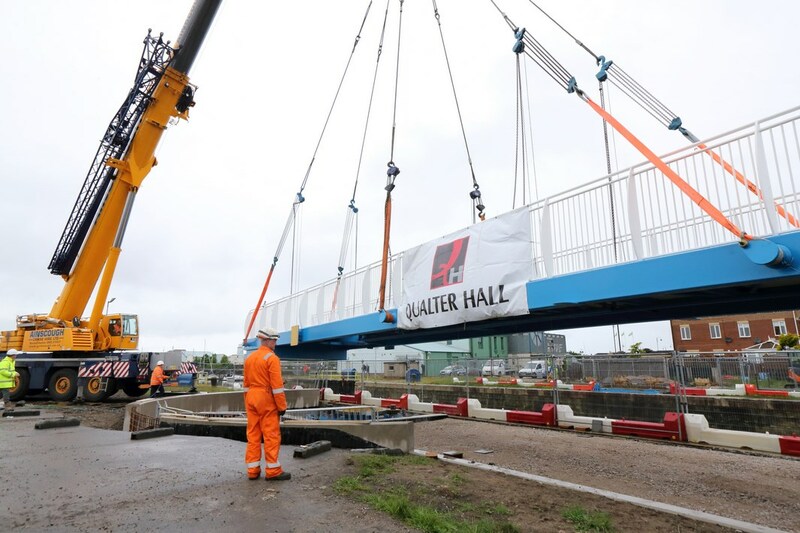 "It is a crucial part of Harbour Village and it is both exciting and satisfying to see it in place, ready for the final installation as the development continues to progress". The swing bridge at Harbour Village will cross the Wyre Marina at the Fleetwood Harbour Entrance Channel on the River Wyre, and will provide pedestrian and cycle linkage from Fleetwood town centre via Dock Street, Queen's Terrace and Station Road through the open space and cycle footpaths within the Harbour Village development and through to Fleetwood Marsh Nature Reserve, Jameson Road and the Wyre Estuary Coastal Path. The bridge is 27m in length and 3m wide. It has a mast height of 10m and weighs approximately 27 tons. Graham Carr, Technical Director for Qualter Hall said: "To transport such a long and wide abnormal load requires detailed planning/coordination and the haulier must choose a suitable route on which the load can travel safely and with minimal disruption to the public, usually moving outside rush hour times and overnight". "The relevant authorities are notified of the intended move, these consist of the police forces and councils of the counties that the load passes through, and the highway, rail and water authorities need to be notified a minimum of 48 hours prior to the move". 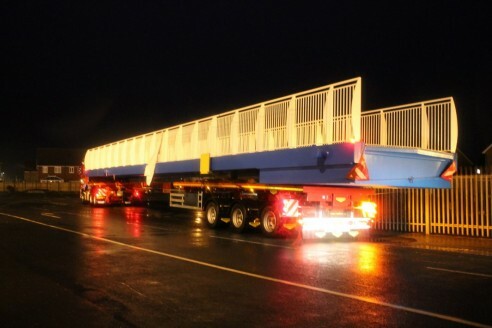 A 200-ton crane was used to lift the bridge off the trailer and lower it onto temporary supports, before final assembly can go ahead, along with fitting and completion of the electrical works required. The bridge can then be rotated and fixed in position. It is expected to be ready for use towards the end of summer.